On the web there is a pool of talented young designers all over each other. What satiate his desire original jewelry, necklace here; we certainly do not see any necks. We love this turquoise pendant signed Max Curious Creature in shopper Store Online Flowers, we can imagine already perfectly worn on a t-shirt or a little black dress. 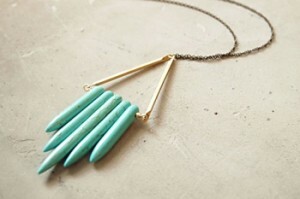 In photo: Turquoise necklace Fan composed of a chain of copper and a large turquoise pendant surmounted by a triangle of brass, length 60 cm (Curious Creature from Flowers, € 39).